With all the suspensions, questionable hits and fighting that have taken over the NHL headlines lately, it’s easy to overlook that for all the guys who walk the line between legal and illegal play. Despite common perceptions, there are many who play the game without any controversy. There are NHLers who’s penalty minutes do not out-number their points, and there are players who are highly effective for their teams without ever having to throw a punch or rough somebody up. Unfortunately for these players, the Lady Byng Trophy isn’t regarded with as much prestige as the other trophies. Hockey is a tough sport, it’s known for bone-rattling hits, agitating, scrums and fights. An award for being gentlemanly? Almost doesn’t seem to fit. But overlooking the Lady Byng is a mistake. It should be considered an honor to win a prize for being an impact player, whether or not it includes trips to the penalty box. Past winners include such skilled players as Mike Bossy, Ron Francis, Joe Sakic, Pavel Datsyuk, Martin St.Louis and some guy named Wayne Gretzky. Playing with sportsmanship in a high octane, highly emotional sport is an accomplishment in itself! This season, a player who has never won before will take home the trophy at the NHL awards this summer. Brian Campbell of the Florida Panthers, Matt Moulson of the New York Islanders and Jordan Eberle of the Edmonton Oilers are this season’s nominees for the Lady Byng. Defenseman Campbell has enjoyed a resurgent year since being traded from the Blackhawks, notching 53 points and helping lead the Panthers to the Southeast Divison title. He had just six penalty minutes in 82 games while leading the NHL in ice time. Moulson scored a career high 36 goals for the lowly Islanders while also racking up just six minutes in penalties in 82 games. 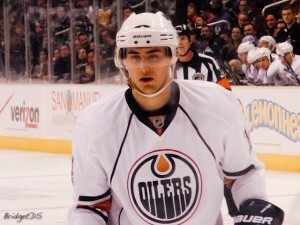 Edmonton’s Jordan Eberle had the most penalty minutes of the trio (10) but had the most points with 76. He lead the Oilers with 34 goals and finished the year a +4. Eberle sometimes flies under the radar because of his high profile linemates, but the 21 year old has been the quiet leader of this young Edmonton Oilers squad, dazzling with his skill and hockey sense. Eberle was rightfully honored to be nominated for the award. He’s in pretty good company too. The 2012 NHL awards are set to take place in Las Vegas on June 20th.